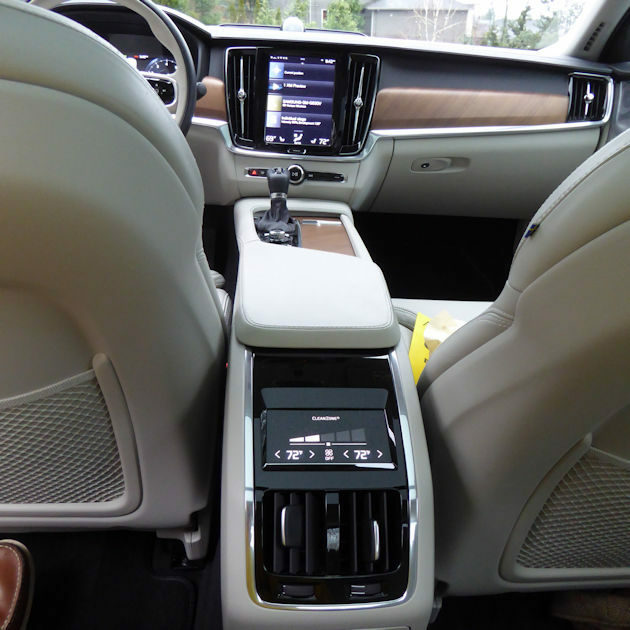 The Volvo flagship sedan hasn?t attracted as much attention as some of the bigger name German and Asian sedans, but if our last week driving the 2018 Volvo S90 is any indication, this sleeper is about to wake up singing an auto-speak version of ?Hey World, You?re Going to Know My Name.? Volvo?s fame comes more from SUVs, wagons and safety than from sedans. 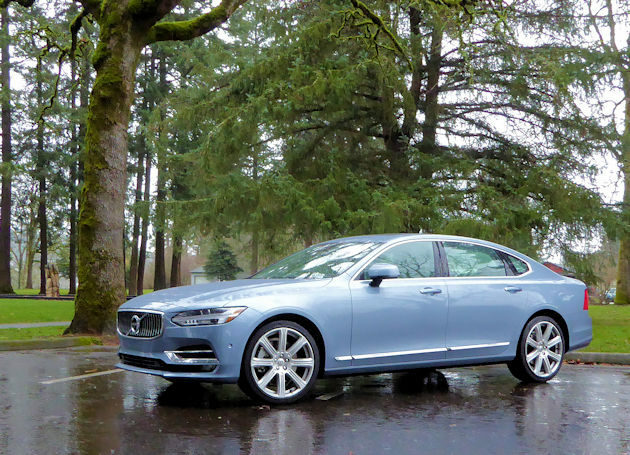 But the 2018 Volvo S90 T6 AWD could move the Swedish brand to sedan notoriety. A dramatic front-end treatment with the Thor?s Hammer daytime running lights, slick broad-shouldered body lines and a simple, uncluttered back end gives the S90 elegant contemporary styling. The rich-looking Mussel Blue Metallic paint that dressed our test car was especially impressive. We often noticed heads turning as we rolled through parking lots and down the freeways, and we even got a few compliments on its good looks in parking lots; ?thank you very much.? The living room has a distinctive Scandinavian design influence and the seat comfort is about the best in the business. 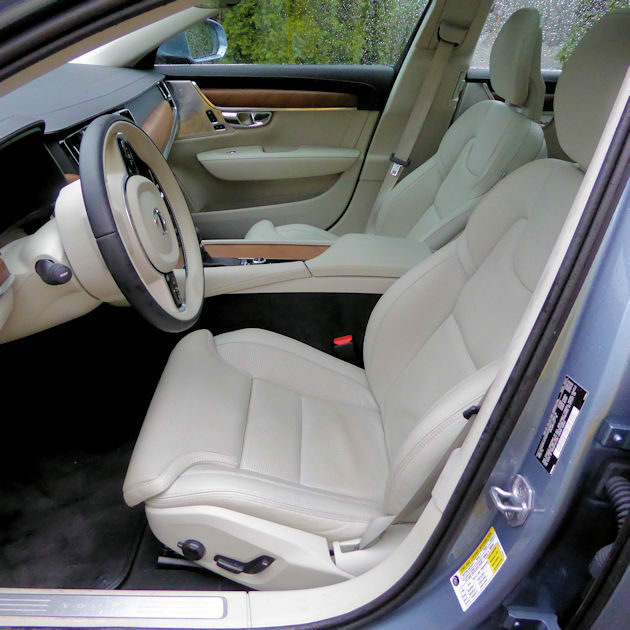 We especially liked the abundant use of walnut trim, soft leather surfaces and simple metallic accents. The instrument panel is a 12.3-inch digital screen which allows the driver to adapt and customize the display with combinations of the gauges, navigation and media information that looks better than their analog counterparts. The 9.3-inch Sensus Connect Touchscreen mounted at the top of the center stack is a user-friendly way to manage the navigation, communications, media and vehicle applications. The handy touch screen uses an infrared technology that even works when wearing gloves. Audiophiles will appreciate the available 19-speaker Bowers & Wilkins sound system. A few years ago, Volvo made the commitment to change their engine line entirely to four-cylinders. 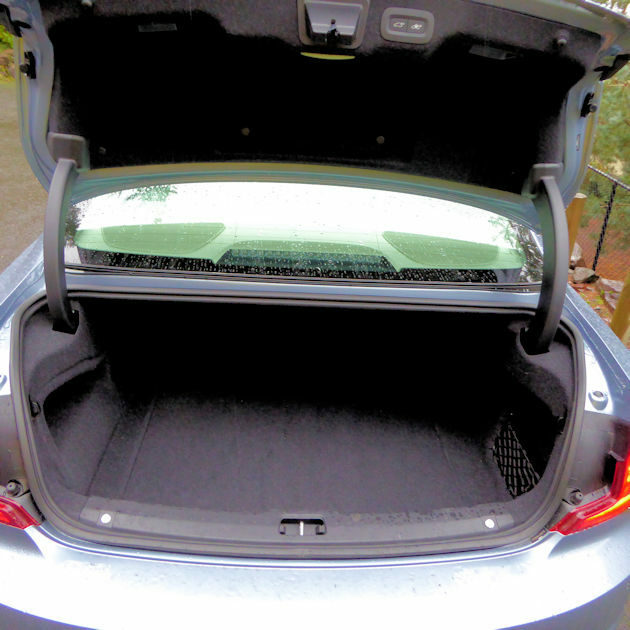 That created a special challenge for building mid-size luxury performance cars. To do this Volvo designed three new 2.0-liter four-cylinder engines systems. One is a 250-hp turbocharged version (the front-wheel drive T5) and the other is a turbocharged and supercharged (all-wheel drive T6) version producing 316 horsepower. The third engine, the T8 AWD, is the same as the T6, but it?s a plug-in hybrid which adds an electric motor to boost total output to 407 horsepower with 640 lb.ft. of torque. The T8 battery is mounted in the tunnel under the car. The T6 and T8 engines have an innovative configuration that uses a supercharger to produce extra power at low engine RPMs and then as the engine speed reaches mid to higher levels (about 3,500 rpms) a larger capacity turbocharger takes over adding extra performance. While in some cases, the four-cylinder engines might not quite equal the performance levels of competitors? V-8 or turbocharged V-6 power plants, they do offer some impressive acceleration numbers with the T6 accelerating from 0 to 60 mph in just 5.6 seconds according to buff magazine testing. The T8 is even faster making that acceleration run in 4.8 seconds according to Volvo numbers. Top speed track is 133 mpg for the T6 and 150 mph for theT8. EPA fuel economy for our T6 test vehicle is listed at 22 mpg city, 31 mpg highway and 25 mpg combined. We averaged 27.3 mpg during our time behind the wheel. The plug-in hybrid is not only faster, but it gets an EPA fuel economy rating of 26/33/29 mpg. Volvo outfits the S90 models with an excellent Aisin-Warner eight-speed automatic transmission with a manual shift mode. The transmission also has four Drive Modes (Comfort, Dynamic, ECO or an Individual setting) that are selected using an elegant looking rotary knob on the center console. Each drive mode changes the engine, transmission, steering, brakes, stability control and start/stop functions to create the optimum setting for the selected mode. Volvo?s quest for safety now includes the world?s first Large Animal Detection with Auto Brake along with the Road Edge Detection & Run-off Road Protection systems. In addition, it has the Blind Spot Safety and City Safety Systems that Volvo pioneered. Volvo is a leader in the self-driving movement. 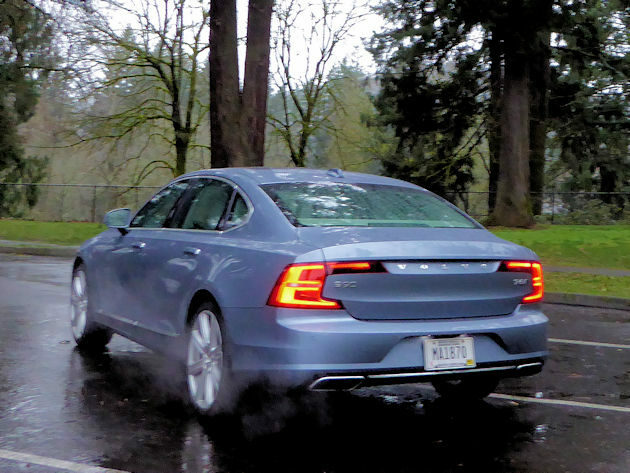 Available now on the S90 is a Semi-Autonomous Pilot Assist System that nearly drives itself, actually steering through corners. However, when we experimented with the hand-free driving, the Safety Monitor admonished us to put hands back on the steering wheel. 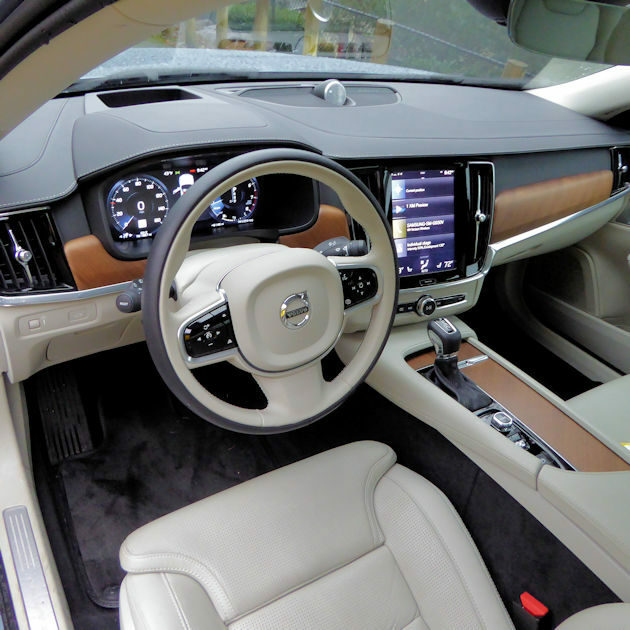 As a luxury car, the Volvo S90 leans more toward comfort than performance traits but when pushed, the car lead the way confidently. 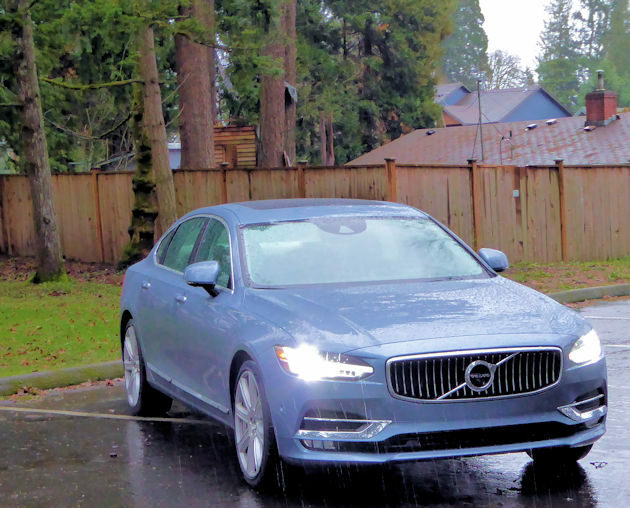 The Volvo S90 T6 feels well-balanced and composed when driving briskly on winding mountain roads, but without the stiffer ride we often experience with some of the luxury performance sedans. 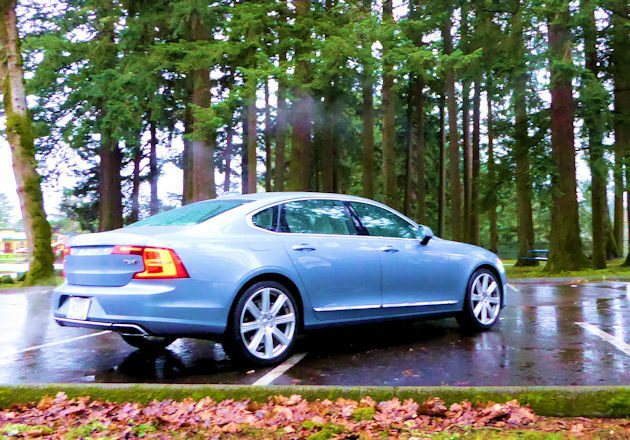 The S90 comes in two trim levels Momentum and Inscription. Prices range start at $49,095, including the destination charge, for the front-drive Momentum T5. Our T6 AWD Inscription test car has a base price of $59,595. The T8 version is priced at $69,145, but it qualifies for a Federal Tax Credit of $5,002. With all the available options, the T8 Inscription can go to about $83,000. Volvo has gone through a labyrinth of ownership changes until 2010 when Zhejiang Geely Holding Group of China bought the Swedish company. Fortunately, all the owners have allowed and encouraged Volvo to be ?Volvo? and not change into some other kind of car company. This freedom and financial support has allowed Volvo to stay a bit quirky and to do things their own way, rather than just being one of the auto industry sheep. Designed to do battle with cars like the BMW 5 Series, Mercedes-Benz E-Class, Hyundai Genesis, Lexus GX, Audi A6, Jaguar XF and a handful of other mid-size luxury cars, the S90 runs with a fast crowd, but we think it?s a contender.